More than 96 percent of Bates students complete a senior thesis. What exactly goes into a thesis, however, is different for every student. For theater majors Gunnar Manchester ’15 and Jonathan Schwolsky ’15, senior thesis involves both putting on a challenging production and exploring their own creative and intellectual process in writing. Note to Readers: A bonus performance of Wasteland takes place at 7:30 p.m. Monday, Oct. 13. For his senior thesis, Manchester, of Rehoboth, Mass., stars in the production of Susan Felder’s Wasteland, in performances at 7:30 p.m. Friday and Saturday, Oct. 10-11, and at 2 p.m. Sunday, Oct. 12, in the Black Box Theater, 305 College St. Playwright Felder will answer audience questions following the Friday and Saturday performances. Jonathan Schwolsky, of North Caldwell, N.J., directs Richard Maxwell’s Boxing 2000 for his senior thesis. Boxing 2000 will be performed at 7:30 p.m. Friday through Sunday, Nov. 14-16, in Gannett Theater, 305 College St. Both plays are open to the public at no cost. For more information, please call 207-786-6161. Although the cast comprises two characters, Manchester is the only actor to appear on stage throughout the 90-minute play. He plays a politically liberal POW during the Vietnam War who, at the start of the play, has been alone in an underground cell for six months. Then another American soldier, the conservative Joe Riley, is placed in an adjacent cell. Although Joe (and the audience) never sees Riley, he hears his fellow prisoner’s voice through a vent in the wall. Riley is voiced by Psychology Assistant in Instruction Brian Pfohl, whose lines will be amplified through a speaker in the “vent” as he delivers them offstage. As two years go by, Joe and Riley develop a bond despite their drastically different backgrounds and ideologies. Wasteland is directed by Katalin Vecsey, senior lecturer in the theater program and Manchester’s thesis adviser. Manchester’s written thesis will reflect on the content and context of the play, the research that went into his performance and his performance itself. 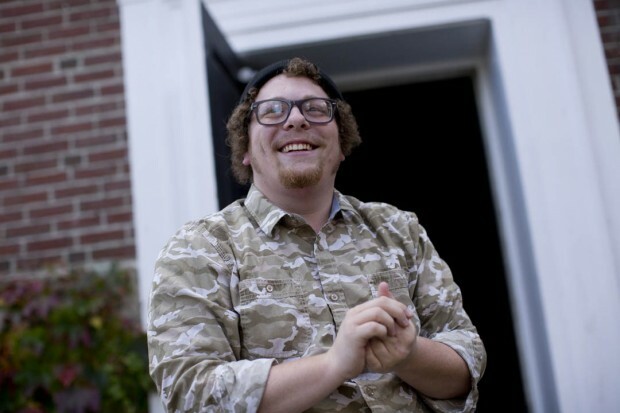 While Manchester has been heavily involved in theater at Bates, he has most often worked in comedy. He is a leading member of both the Strange Bedfellows, Bates’ improvisational comedy group, and the Robinson Players, Bates’ student theater organization. His role in Wasteland is more dramatic and deals with, amongst other things, political division, war, loneliness and despair. However, he notes that the play sends a message that humor and hope can help, “no matter how dark things get.” He says, “You’ve got to keep hope going,” he says. For Schwolsky, the challenge of directing a senior thesis production is an opportunity to collaborate and experiment. In Boxing 2000, a young man, Freddie (Will Dunbar ’15), pursues underground boxing with the help of his older brother JoJo (Alex Moscovitz ’16). The play uses boxing culture as the framework for a discussion about masculinity and community. As director, Schwolsky sought actors who would bring in their own ideas about the play. “The director is not the one in charge, but the one with the vision,” he says. Last spring, Schwolsky read 14 plays by Maxwell to prepare for his thesis. He was drawn to the colloquial language and universal message in Boxing 2000. Maxwell himself directed the original production of the play with the goal of mimicking reality as closely as possible. His actors spoke simple, often mundane dialogue in monotone. As he directs the play, Schwolsky hopes to take inspiration from Maxwell’s vision and expand upon it with his personal vision. He collaborated with professional set designer Simon Harding to design the unusual two-tiered set. The audience will sit around and look up at a 5-foot-tall square platform in the center of the theater, where the action will take place.